7/27 Cup of Coffee: It was a tough day on the farm, as only two of yesterday's eight games resulted in wins for Red Sox affiliates. Four of the six losses were decided by one run, including a 16-inning contest between the Salem Red Sox and the Frederick Keys (BAL). The Lowell Spinners and the GCL Red Sox took home victories, although Lowell was only .500 on the day after dropping the other half of a doubleheader. After leading for most of the game, the Pawtucket Red Sox lost 4-3 to the Lehigh Valley Iron Pigs (PHI). The PawSox jumped out to an early lead 3-0 lead after scoring one run in the second inning and two runs in the third. Alex Hassan scored the first run of the game on a fielding error and clubbed a two-run home run in the third inning. Behind a strong start from Allen Webster (pictured), the PawSox were able to keep the lead. Webster went six strong innings, giving up three hits, three walks, and two runs to go along with four strikeouts. In the eighth inning, with the score 3-2, reliever Chris Martin surrendered two runs, the lead and the game. The Portland Sea Dogs were downed 7-5 by the Harrisburg Senators (WAS) in what was a back-and-forth, high-scoring game. Although the Sea Dogs never led, almost every time Harrisburg scored Portland would respond in the bottom of the frame. Heading into the ninth inning, the game was tied at 5 when Harrisburg scored two runs off Bobby Lanigan. The Sea Dogs picked up a base runner in the bottom of the ninth, but were unable to muster enough to keep the game alive. Despite scoring five runs, Sea Dogs batters only picked up seven hits and three RBI. Leading the charge was second baseman Derrick Gibson, who was 2 for 4 with three runs scored. The Salem Red Sox fell to the Frederick Keys (BAL) 3-2 in a 16-inning marathon game Friday. The team was led by starting pitcher Mike Augliera, who gave up only two hits. one walk and zero runs in seven innings. Augliera was backed up by Kyle Kraus, Nate Striz and Robby Scott, all of whom threw three innings. It was a tough day at the dish for Salem, as only hitter Nick Natolti, collected two hits. There were only two extra-base hits in the game, with doubles from Cody Koback and Stefan Welch. The Greenville Drive dropped their contest against the Lakewood BlueClaws (PHI) by a score of 7-6. Drive starter Francellis Montas was tagged with the loss after giving up five runs in five innings pitched. Most of the damage was done in the fifth inning when the BlueClaws scored five runs, three of which were charged to Montas. At the dish, the Drive were led by right fielder Kendrick Perkins, who went 3 for 4 with two runs and an RBI. The Lowell Spinners split two halves of Friday's doubleheader against the Connecticut Tigers (DET) on Friday, winning 6-0 and losing the other 3-2. In the Spinners' win, starting pitcher Jamie Callahan pitched splendidly, allowing only one hit in six innings of work. He struck out eight on the way to his second win of the season. Leading the way at the plate for Lowell was designated hitter and clean-up man Kevin Mager, who went 4 for 4 with three RBI. In the other half, the Spinners put up a good fight before falling in an "extra-inning" affair. The game, which was supposed to go seven innings, was tied following the bottom of the seventh, which led to an extra eighth frame. The Spinners bats had a tough time in the loss, as they struck out 13 times total and only amassed six hits. Two of those hits came off the bat of Nathan Minnich, who had Lowell's extra-base hit. The DSL Red Sox were dropped by the DSL Athletics 3-1. The team was unable to capitalize on a strong start from pitcher Luis Ramos. Ramos went six innings and gave up only three hits. 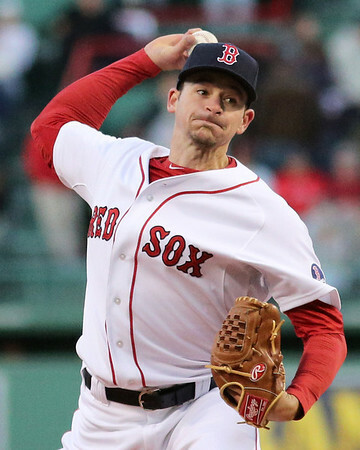 At the plate, the Red Sox mustered only four hits and two walks against eight strikeouts. The GCL Red Sox toppled the GCL Twins by a score of 7-3. Behind a 13-hit attack, the Red Sox hung seven runs on the GCL pitching staff, including six runs after the fifth inning. Three batters picked up multi-hit days, including Aneudis Peralta, Bryan Hudson and Deiner Lopez. Starter Randy Perez was impressive in five innings of work, striking out five and giving up three hits and one earned run. Player of the Day: Young 18-year-old Jamie Callahan pitched his best game of the season so far Friday, giving up only one-hit in six shutout innings, while striking out eight. After hurling a one-hit shutout in his debut this season, Callahan struggled until Friday's performance. On the season he has a 4.55 ERA with 23 strikeouts in 27 2/3 innings pitched. Photo Credit: Allen Webster by Kelly O'Connor. Luke Lavoie is a Staff Writer for SoxProspects.com.